On 10 July 2012, Singapore Parliament passed the Patent (Amendment) Bill and the Intellectual Property (Miscellaneous Amendments) Bill geared towards strengthening and enhancing Singapore’s patent system in order to support Singapore’s growing international patent capabilities, and developing Singapore as a global Intellectual Property (IP) hub in Asia. The amendments are intended to a) change the current “self-assessment” patent system to a new and enhanced “positive grant” patent system; b) liberalise the patent agent sector; and c) streamline and harmonise the IT system and procedures of the different Registries at the Intellectual Property Office of Singapore (IPOS). The “self-assessment” patent system was a practical approach recommended by WIPO when Singapore first started its own patent system in 1995 to encourage applicants to register their patents in Singapore. To date, there are more than 75,581 Singapore patents granted by IPOS. Under the “self-assessment” system, when filing a patent application at IPOS for grant of a patent in Singapore, an applicant is required to decide on the route of examination that he wishes to rely on to satisfy the search and examination requirements prior to grant. Unlike other jurisdictions, there are several search and examination options available depending on the needs of the applicant. For example, an applicant can i) rely on the established International Preliminary Report on Patentability (IPRP), or ii) rely on a prescribed corresponding granted patent, or iii) request for local examination based on established search report, or iv) request local search and examination. Based on the above established search and examination reports or the prescribed corresponding granted patent, an applicant can proceed to request for the grant by paying the required fees. IPOS will subsequently issue the patent once it is satisfied that the formal requirements have been met and the application is in good order. 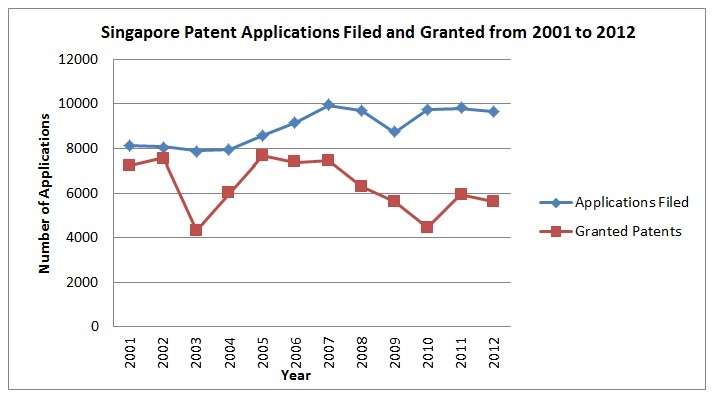 The uniqueness of the “self-assessment” system lies in the fact that the applicant is given the opportunity to decide whether they wish to proceed to obtain a grant of patent. This means that the applicant can apply for and obtain a patent in Singapore even if the outcome of the examination is not favourable and the invention does not fulfil the patentability requirements, namely, novelty, inventive step and industrial applicability. However, the onus is on the applicant to ensure that his invention is valid and patentable prior to the patent being granted, as the validity of the patent can subsequently be challenged by a third party. Official statistics indicate that for the past 5 years, more than 90% of the patents granted in Singapore are based on a positive examination report. Under the new “positive grant” patent system, the decision to grant a patent now rests in the hands of the Registrar and only patents which have been searched, examined and fully satisfy all three patentability requirements will be allowed to proceed to grant. Under the new section 29A of the Singapore Patents Act (“the Act”), the Registrar will issue the Notice of Eligibility informing applicants that their patent application may proceed to grant only if the examination report does not contain unresolved objections on patentability. If the Registrar believes that the examination report contains one or more unresolved objections, a Notice of Intention to Refuse the application will be issued to the applicant. Under the new section 29B of the Act, the applicant may apply for review of the examination report. The applicant may also use the opportunity to provide written submissions and/or to amend the patent specification to overcome any unresolved objections. Thereafter, the Examiner will issue an examination review report based on the prior examination report and the applicant’s written submission and/or amendments. Upon receipt of the examination review report, the Registrar will either issue a Notice of Eligibility to proceed to the grant of a patent or, if the objections remain, a Notice of Refusal to grant a patent. A new provision wherein an applicant may still rely on the final results of any search and examination as to the substance of a corresponding application, a corresponding international application or a related national phase application, or where the application is a national phase application, the final results of any search and examination during its international phase, by filing a request for a supplementary examination report based on the above results. A new provision pertaining to the review process of examination reports, search and examination reports and supplementary examination reports. The prescribed period to file a request for supplementary examination report will be 54 months from the earliest priority date or filing date. The prescribed period to file a request for combined search and examination or request for examination based on the foreign search result will be increased from 21 to 36 months from the priority date or filing date. The period for responding to a written opinion in respect of a supplementary examination report will be 3 months from the date of Registrar’s letter. The prescribed period to file a request for review of a negative examination will be 2 months after the date of Registrar’s letter forwarding the Notice of Intention to Refuse. The rules pertaining to filing of block extension have been removed. The shift to the “positive grant” patent system is a significant move forward for Singapore and has received strong support from both IP practitioners and those from relevant industries. The shift will more closely align the Singapore patent system with other established patent offices like the European Patent Office, Japan Patent Office, UK Intellectual Property Office and the United States Patent and Trademark Office. The new patent system will also minimise weak patents and raise the overall quality of patents granted in Singapore. This will strengthen business and investor confidence in the quality of the patent system and the patents granted, as well as encourage greater innovation within Singapore. The amendments to the Act also allow for foreign-qualified patent agents to be registered at IPOS on the basis of their foreign qualifications and to undertake offshore patent agency work in Singapore. However, the scope of work that the registered foreign patent agents can undertake will be limited to applying for and obtaining patents at foreign patent offices other than IPOS; preparing patent specifications for filing patent applications, including PCT international patent applications, outside of Singapore and providing advice on other countries’ patent laws. This change will enable more international patent firms to set up practices in Singapore and will provide Singapore with greater access to international patent expertise to meet the growing demand in the region for professional patent services of international quality. The relevant sections of the Patents Act, Plant Varieties Protection Act, Registered Designs Act and Trade Marks Act have also been amended to support the streamlining and harmonisation of the IT system and processes of the various Registries at IPOS. A new integrated Registries IT system will be introduced. Common forms will be used across the Registries, e.g. the form to request the change of name and address of agent, applicant, proprietor or other interested person. Such amendments will create greater consistency, and improve efficiency and cost-effectiveness when dealing with the different Registries. The new integrated Registries IT system will make it easier and more convenient for customers to perform transactions and access information related to the different types of IP online via IPOS’s IP portal. The draft amendments to the Patent Rules also seek to align the process for patent hearings with those of other types of IP, as well as providing clarity and streamlining certain procedures in contentious patent proceedings. The proposed amendments will be applicable to patent applications (as well as divisional applications) and other non-contentious proceedings filed after the effective date of the amendments. For contentious proceedings however, the proposed amendments will be applicable to all actions regardless of whether or not they were initiated prior to the effective date of the amendments. In summary, the amendments are a timely and a positive move for Singapore, which will help to enhance and strengthen Singapore’s patent system, and support the growth of international IP capabilities and establish Singapore as a world class, Asian IP hub.